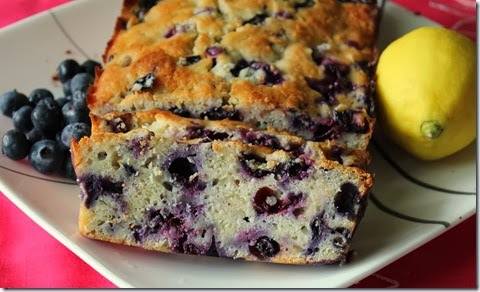 This sweet breakfast bread tastes just like a giant blueberry muffin,, The combination of blueberry and lemon is JUST perfect! I think next time I may add a little more zest..
Preheat your oven to 350 degrees. Spray a loaf pan with nonstick cooking spray and set aside. In a medium sized bowl, whisk together your flour, baking powder and salt. Add the blueberries and lemon zest and toss to combine. Cream together the butter and sugar until light and fluffy. Add the eggs, one at a time, beating well after each addition. Add the yogurt then the dry ingredients, mixing only until incorporated and being careful not to crush the blueberries.